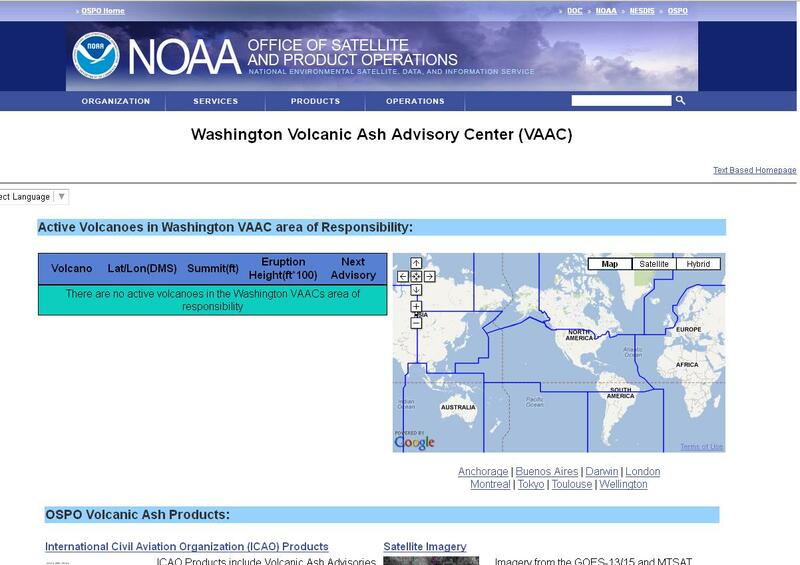 Washington VAAC - Volcanic Ash Advisories After a strong eruption, volcanic ash will stand out against the background of low clouds, cirrus clouds (composed of ice), and cloud-free regions in satellite imagery. This text product is created referencing infrared, visible and multi-spectral satellite imagery along with other guidance. The written text message incorporates what can currently be seen in imagery, pilot reports, observatory information, forecast trends and other available information. HYSPLIT Trajectories The HYSPLIT model is the newest version of a complete system for computing simple air parcel trajectories to complex dispersion and deposition simulations. SO2 Detects from Ozone Monitoring Instrument (OMI) The OMI_SO2 product utilizes the SO2 absorption channels of the Ozone Monitoring Instrument flown aboard NASA's Aura spacecraft to identify and monitor passive SO2 outgassing and SO2/ash emissions from volcanic eruptions. A global composite as well as a set of fixed volcanic regions containing near real time SO2 signatures are updated on a daily basis. Real Time GOES Volcano Imagery Satellite Imagery over volcanoes of interest and those being monitored by the Washington VAAC. Still and loop imagery with multiple enhancements is featured.